In a small mixing bowl, combine all the sauces, except the vegetable oil, with the salt and sugar. In a very hot saucepan on high heat, heat the oil and then stir fry the pounded ginger and garlic. Once the garlic starts turning brown, throw in all your vegetables. Try and turn all the brussel sprouts cut side down on the pan. Pour over your sauce over your veg and leave it to fry (do not toss the vegetables) for 2 minutes. 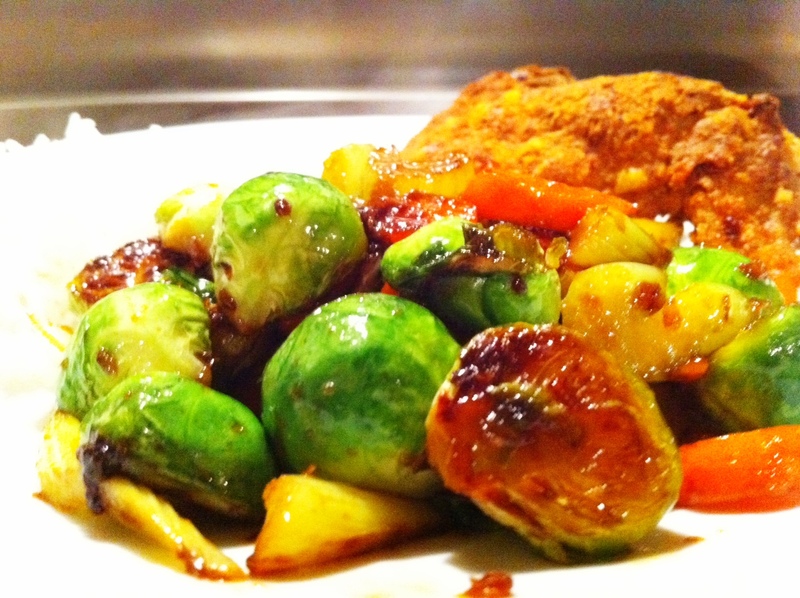 most of the sauce should have evaporated while caramelising the flat side of the brussel sprouts. If you like your sprouts softer, let them stir fry for another minute but if you like them crisp and crunchy like me, 2 minutes is all you’ll need. I ate mine with a piece of crispy oven baked chicken wing and a small portion of steamed white rice.